Travelers. Warriors. Rulers. Merchants. And any other who finds themselves stepping through a portal in the Blue Hills. Welcome to the pocket dimension of Taen - a hostile, untamed wilderness mostly untainted by human influence. With frequent rifts in space-time, four unique environments, and a race of invasive insectoids, it may just be the most alien place in Terrenus. As a newly-discovered territory, Taen's history in Valucre is left wanting. Little is known of the vast, unexplored land. Its lore is still pliable. You, as writers, have an opportunity to mold Taen’s reality. 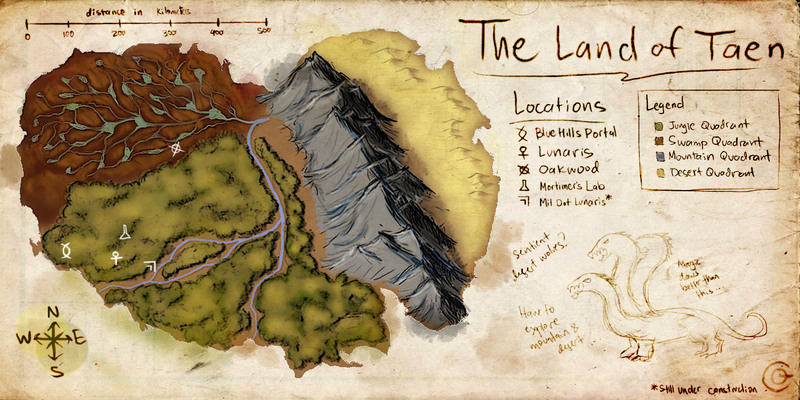 Travel to the edges of the land and mark otherworldly landmarks and locations on the map. Hunt down and document the myriad of animal species that roam the wilds. Fight the aggressive Xer-Orians to free the land from their influence. Spread the Empire's influence. Uncover ancient powers of magic and science that hold this dimension in its unstable, erratic state. Found a city. Make your mark and shape this land with everything you've got. Or it might just make its mark on you instead. It is summer. With most of Lunaris finally rebuilt (though many homes are now on the ground rather than in the trees), adventurers are looking outward and beginning to travel further into Taen. Many new buildings and communal areas are on the rise. Currently, there is a relative peace blanketing Taen with the Xer-orians having retreated back into their core hive and with most of the Salamanders dead or in deep hiding. The temperatures all around Taen are at an unusual high, sometimes reaching nearly 115 degrees Fahrenheit. Some of the smaller rivers are drying up, causing some worry that Taen might run out of water. It has not rained for nearly a month now. Taen Quests and Canonization - View all the available and ongoing quests and learn how to canonize your threads. Taen’s Book of Beasts - A list of Taen's sentient races, natural fauna, and not-quite alien beasts. Taen HQ - A place where you can chat with other Taen RPers and the board managers. Taen is best described as a "world within a world" - a small slice of land within the larger realm of Valucre. Officially, Taen is located within the Blue Hills, 320 kilometers northeast of Casper and 800 kilometers southwest of Ignatz. However, one can only enter it through the many portals scattered in the Hills that open into the westernmost edge of the land. Taen has an approximate land area of 100,000 sq. kms. At the border of the land, the sky and ground simply end, nothing but a featureless void beyond. Taen was first discovered by a band of explorers led by Marik Cayne. After investigating a mysterious gas in the Blue Hills, an attack by a foreign insectoid race called the Xer-orians led to them killing its queen. The Xer-orian queen's death caused a magical explosion, shattering the barrier between Terrenus and Taen. This created the first of the many inter-dimensional portals that would lead into it. Currently, most of Taen is unexplored. There is one official Valucrean settlement - Lunaris - where migrants from Terrenus have made their home in the new land. One of Taen’s native races - the nature-loving Mork’Ouths - coexist with the settlers from Valucre. However, the insectoid Xer-orians are aggressive and frequently attack foreigners to Taen. For Taen's current status, see The Present under the Timeline category below. Taen is divided into four distinct areas, each with a different environment and biota. These are referred to as quadrants. Each quadrant’s name is a direct translation from it’s name in the Mork’Outh language. Quadrant I: Jungle (Ma’ulap) - The Jungle Quadrant is the largest of the quadrants, covering most of Taen’s southwest. Ma’ulap is composed of a humid, tropical forest constantly shrouded in a low-lying cloud cover. Here, the bountiful flora and fauna seem indistinguishable - plants are carnivorous, animals sport leaves, and both seem quite keen on eating any adventurers. 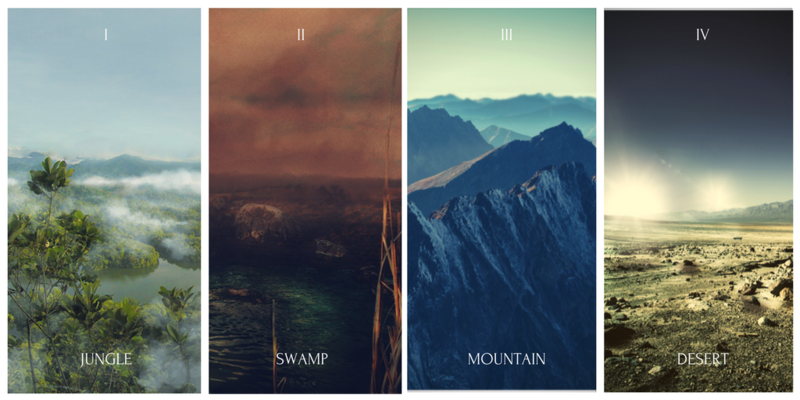 Quadrant II: Swamp (Rumi) - The Swamp Quadrant is an eerily silent, dimly-lit stretch of wetland that spans the northwestern edge of Taen. It is known for the ever-present, toxic fog produced by the unique cocktail of bacteria and decomposing bodies that saturate the ground underfoot. Quadrant III: Mountain (Ta’as) - The Mountain Quadrant is composed of a mountain ridge that stretches from Taen’s north to south, forming the backbone of the land. In the higher altitudes, it is characterized by strong winds and frequent storms, making travel difficult. Notably, the Quadrant’s vegetation seems to mimic that of the Blue Hill’s, appearing blue. The mountains themselves hold an extensive system of caverns which have yet to be explored. Quadrant IV: Desert (Init) - The Desert Quadrant is the smallest in surface area, yet possibly the most hazardous of the quadrants. Located in the far northeast, it is a barren wasteland only accessible through by travelling through the Mountain Quadrant. Mortimer's Research Laboratory of Extradimensional Matters and Magical-Affected Physics - The personal laboratory of Dr. Mortimer, which also functions as an apothecary. The Mil Dot Lunaris - A gun store with a foodservice section that's somewhere between a diner and a café. Oakwood - The city of Oakwood is a thing of mystery. Unlike Lunaris, the fully-formed city simply appeared in the midst of the Swamp Quadrant one day, complete with buildings and citizens. Its existence is currently unstable, as it flickers in and out of Taen. The only accessible and seemingly-stable place in Oakwood the moment is the Black Cherry Bar. Taen appears to have two suns. The first is the actual sun, the other an atmospheric phenomena called a parhelion - a "mirror sun". The atmosphere itself is also thicker and heavier, with less oxygen than that of Terrenus outside. Due to this, long-time inhabitants of Taen are more accustomed to strenuous activity. Taen has a tropical monsoon climate, experiencing high temperatures during the summer and heavy rainfall during the winter (with the exception of the Desert Quadrant), but no snow. Similar to the rest of Terrenus, the pocket dimension has a thick Arcanosphere composed of a strange type of magic the native Mork’Outh call sansiuk (worldrift, or ourano-chronomancy) which is the same force that randomly generates portals from other realms. The other predominant form of magic present in Taen is kalika (wildlight, or biomancy), which is the force of nature and life and stems from the land itself. Glowing bright blue, swirly, rippling borders that distort spacetime and the fabric of reality? You likely came through one of these. Thankfully, these at least seem to stick to some semblance of consistency. Many one-way portals to Taen are scattered around the Blue Hills, but all these lead to the a single exit portal a mile southwest of Lunaris. Taen’s main exit portal, located southwest of Lunaris, is the main exit/entry point of Taen for Valucre. This is the only reliable means of exit from Taen to the Blue Hills. *The Mork’Outh know how to close them when they pop up, but they tend to leave the portals alone. ** A group of Taen mages, with the help of Mork’Outh, created it through a lengthy, complicated process I haven’t bothered to understand. The Mork’Outh refused to explain, saying this was a favor they did for Emperor Titus, and preferred to keep the process secret. I don’t know how. The Genius Loci allowed it, I guess. Taen is officially ruled by Titus Demetrius, the archangel Emperor of Taen. It is home to the migrants from Valucre (mostly residing in Lunaris), and the two sentient races native to the land - the Mork’Outh and the Xer-orians. The settlers from Valucre are predominantly humans and elves. Most of them reside in Lunaris, though there are other smaller settlements scattered across Taen. In the time they have spent in Taen, a unique culture has formed. One of the traditions by the Taenites is to tattoo symbols of the quadrants they have traveled to on their bodies as badges of pride, as survival is hard in this harsh land. The Mork’Outh are a pacifist race whose culture and religion is deeply embedded in nature. They appear humanoid, but have goatlike horns, bark-like skin, and clawed hands and feet. A common misconception is that their hair is made of vegetation- in truth, they simply braid their hair with living vines. The Mork’Outh speak a native language that’s still being deciphered, but can communicate over long distances and with other species through Taen’s semi-sentient Elder Trees. The whole race is skilled with Taen’s two natural magic forms - nature and space-time. The Xer-orians are an aggressive, hostile insectoid race that seek to gain control of all Taen. Xers - as they are more commonly known - have an advanced society with a structure similar to insect colonies, with several females (referred to as Queens) controlling the masses as several hive minds. This also gives the females As their existence seems tied to the emergence of the portals, they may be of extra-dimensional origin. They are a known enemy of the Mork’Ouths and human Taenites, and have strong psychic abilities. Marik Cayne - The leader of expedition that led to the discovery of Taen and the Founder of Lunaris. Dr. Carina O. Gomez - A field agent and head researcher from Aurelium Inc. who is the primary source of info about Taen. Sebastian Heiliger - the newly-appointed Governor of Lunaris, and the current head of the city in Titus' absence. The information in this section is only a summary. A more in-depth guide to Taen's history can be found in Updates and Canon. The following are the notable events of Taen’s history. The Founding - After a group of adventurers investigated a mysterious gas in the Blue Hills, an attack by a foreign insectoid race called the Xer-orians led to them killing its queen. The Xer-orian queen's death caused a magical explosion, shattering the barrier between Terrenus and Taen. This created the first of the many portals that would lead into it. An Unintentional Awakening -Through one of Taen's interdimensional rifts, a gigantic, multi-headed monstrosity - a Hydra - emerges and starts threatening the land. 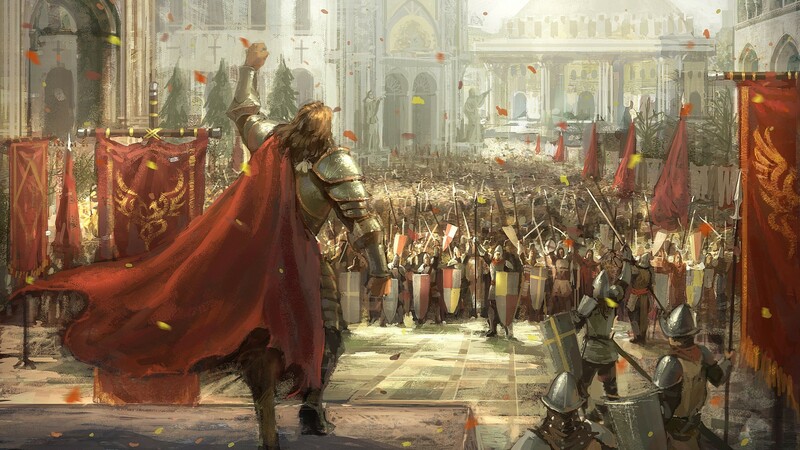 With the help of several adventurers, Titus Demetrius defeats the Hydra and is crowned Emperor of Taen by the Mork'Outh, who pledge their help to rebuilding Lunaris. Official Letter of Appointment - Sebastian Heiliger is appointed Governor of Lunaris through a letter from Emperor Titus, with Carina Gomez as his advisor. Updated Present and Notable Events for history. Every soldier carries with them a watch placed over their bare skin. The watch keeps a reading of their heartbeat, pulse and performs constant DNA readings of its bearer for security reasons. This watch relays bodily information instantly to the database that only the King and his QN Generals can access. The watch is controlled through voice determination and relay magic. For example, a soldier can order the watch to call or relay a message to a commanding officer. All messages must be recorded out loud, but messages can be listened to directly into the mind- similar to how telepaths communicate. The watch, however, is only a machine and doesn't do anything on its own. Whether it is to listen to or speak to someone, the order must be put to the watch. If a watch's user dies, the watch breaks down into particles. A watch can only communicate with other soldiers lower than one rank above him or her. This means that a Pawn cannot speak past his Cube's Knight and a Knight cannot speak past his Unit's Bishop. This is in place to restrict overload and misinformation. Special Forces: Elemental Benders- A special group of soldiers placed strategically throughout the main cells. There are a set numbers of elemental users in Water, Earth, Fire and Air. Pawn- Similar to how you would think, this is the soldier that is put on the front lines. Though some people view pawns as expendable, without a large numbers of soldiers acting as pawns winning a war would be nearly impossible. Pawns command no one and must listen to their Cell leader, a Knight. Pawns are trained to have absolute obedience to Knights. Knights: Each Knight is directly in charge of commanding 5 Pawns. Knights report to the Bishops but the Knights are usually given a lot of free reign in acting. Knights are also trained to constantly be in contact with on another. They are, however, required to report any and all changes to the Bishops. Any order from a Bishop is absolute. Knights are generally less obedient than Pawns but they always listen. Bishop: A Bishop of Taen has nothing to do with religion. It is simply the name of a position in the Military given by a very lazy King. Bishops act as the go between, reporting the actions of the Knights to the Rooks and give orders to the Knights from the Rooks. Each Bishop is in charge of 10 Knights. Whereas the Knights are more focused on the actual battle and communicating with the other 10 Knights in their Unit, the Bishops job is to think more theoretically and strategically in a play by play moment. Rook: Rooks take care of the Quads and make sure that all the Bishops and Knights are doing their jobs. If something goes wrong in one of the Quads, it's on the Rook to find out what caused it and fixed it. It is also the Rooks job to relay orders from the QN Generals and to communicate the actions of their Quad with the other Quads. A Rook is in charge of 10 Bishops. QN Generals: QN Generals are the War Generals of the King who are each in charge of two Rooks and thus half the military each. The two QN Generals are there to look at the big picture and command the lower ranks in their half of the military in accordance with how to win. They are also there to advise the King and relay direct decisions made by their King. While they will be heavily punished, the QN Generals can disobey the King if they find his decision stupid. King: The big boss. The man in charge. He's in charge of the entire army but, for the most part, only gives orders directly to his QN Generals or his Rooks. Elementals: Elementals are a special forces unit that aren't part of the general system of hierarchy. The report directly to the King and his QN Generals who deploy them to whichever Quad needs them the most. The Elemental then chooses themselves where in the Quad they are needed. They are in charge of no one besides themselves. There are 53 Elementals. Argonauts: These are entities which serve the Emperor directly from their respective territories. They only get involved in times of great need. With their abundance of power, they can be classified as Legend Tier and on par with Terrenus' Peacekeepers. However, their power is chained to the territory which they protect. Leaving that territory renders them with the same strength as an ordinary character. A Black Unit (BU) x 1: All of the Elementals. 20 Units are infantry/ foot soldiers: 1,000 Pawns, 200 Knights, 20 Bishops . They are armed with a range of weapons that are all close combat. The weapons can range from a plain sword and shield, to spears and more specialized weapons. The Taen Military keeps on hand extra weapons at the base within magic dimensions to make sure the Units are always as up to date as possible. 4 Units are Snipers: 200 Pawns, 40 Knights, 4 Bishops. Each Quad as 1 units of snipers. Snipers are armed with custom rifles made for accuracy. Snipers are trained in stealth, camouflage and accuracy. The rifles are embedded with penetration magic that can pass through shields if it's straight on. If the shields are tilted that the bullet is likely to ricochet. 10 Units are Calvary: 500 Pawns, 100 Knights, 10 Bishops. They ride on a variation of beasts ranging from the classic horse to moose to interesting creatures from Taen (refer to Taen Bestiary for the possibilities). 5 Units are Anti-Calvary: 250 Pawns, 50 Knights, 5 Bishops. These soldiers are armed with spears longer than the normal spear. Anti-Calvary members are trained to throw their spears with dangerous speeds and accuracy. 1 Unit are War Machine user: 50 Pawns, 10 Knights, 1 Bishop. They are trained in utilizing the 10 War Machines that the Military has. There are 4 turrets (each in a different Quad) and 6 militarized cannons that are armed with exploding projectiles. D.I.C.E. is a government organization that acts apart from the military. While it is still under the direct control of Taen's Emperor, Titus Demetrius, D.I.C.E. operates as the intelligence organization for Taen and is given a lot of liberty to act on its own. Per the rules surrounding its conception, D.I.C.E. maintains a jurisdiction on Taen's entry portal. Under orders from Emperor Titus, they set up a dual Outpost mechanism: one is set up on Taen's side of the entrance portal, while the second surrounds a handful of portal on the side beyond the pocket dimension. There hasn't been any restrictions into the Entry and Exit of civilians- the outposts are only there as a precaution to possible invasive forces from the outside. Already a handful of Terran Military Agents have been turned away after D.I.C.E. agents became suspicious of their activities. A series of hostile feelings arose between D.I.C.E. and the Terrenus military branch known as T.I.T.A.N. after D.I.C.E. refused entry to a group of undercover T.I.T.A.N. agents seeking to gather information. With the take over of Ursa Madeum, the jurisdiction of D.I.C.E. was expanded. Unlike the Taen military which acts as the sword and shield of Taen, D.I.C.E. is akin to the quicksand of Taen. You don't even know it's there until it already has you. D.I.C.E. 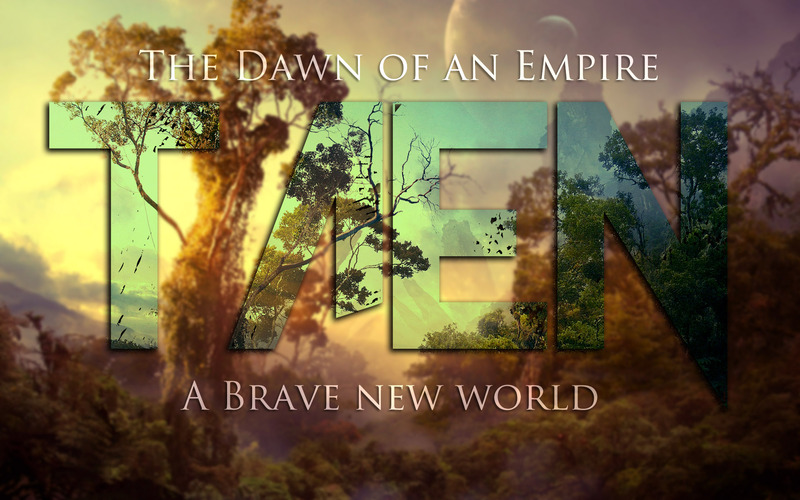 is Taen's influence outside of the Pocket Dimension- an organization that is always locked in battle with forces that may threaten the independence of Taen, be that T.I.T.A.N. or any other agency. Their job is to stop the attacks before they happen, before the perpetrators would be allowed into Taen. This of course does not encompass lower level dangers, only large scale schemes or enemies. The single concession made to D.I.C.E. 's lack of jurisdiction within Taen, was to give them the authority to fight congregate back within the Pocket Dimension should another Realmtide happen.  Every character begins at Ensign unless canon circumstance arise that require the bending of this rule. A promotion is earned upon the completion of a Mission. Like a quest, a mission must be canonized, approved, and surpass a predetermined number of posts or threads. Now unlike quests, mission requirements will be held to a stricter standard. There will be no leeway if a mission is completed but did not reach the minimum requirements. This is to ensure that people aren't simply spamming their way up the ranks. Missions will be posted along side Quests. In fact, a D.I.C.E. agent can take on a Quest as an agent and have it count as a mission rather than a quest. 1) You PM me a mission request containing what exactly you'd like the mission to be (i.e., the details of the mission you'd like to go on). 2) You PM or tag me in a post at HQ with the Mission you've chosen. 3) You may choose a Quest or Mission from any board in Valucre. Once you have my approval, it can count as a D.I.C.E. mission.